Have you heard about the new Google+ Communities? Google+ Communities allow you to collaborate with others on topics you’re passionate about. And it’s a great opportunity for marketers to network, engage and build the businesses they support. This article will reveal everything you need to know about Google+ Communities and how to leverage them for business. A Google+ Community is a place to meet and engage with people on topics you’re interested in. If you had trouble finding engagement on Google+ in the past, it’s time to take a second look and check out active communities on topics you care about. Watch this video from Google+ to see how communities work. Not only will you find great discussions going on, but you’ll also meet great people who share your interests. And this will help build your relationships and expand your network. You can create public communities and private communities. There are already thousands of communities forming—and you can find dozens of communities on almost every topic imaginable. Jason Keath, Nick Cicero and Corey Creed moderate the Social Media Marketing community. Andrews Harasewych, J.C. Kendall and Tom Bukacek manage the Social Media Strategy community. Kim Beasely created the Social Media Marketing for Business Owners community. Jen Reeves, Peter G. McDermott and Tom Rolfson moderate the Community Moderators group. 1. Grow your own network by engaging with others on topics you care about. If you’ve had trouble engaging in conversations and meeting others in Google+, you now have an easy way to find people who are passionate about the same topics you are by joining relevant communities. Join a community, answer questions, post your thoughts and you’ll meet some interesting people and grow your network at the same time. For example, I’m interested in connecting with others and sharing ideas about using LinkedIn, so I started the LinkedIn for Business community. Within 4 days, this community grew to 54 members and I’ve been learning and engaging with some great people. The first post in the group continues to get engagement. 2. Discover your target market’s questions, challenges and interests. Communities can be like a focus group for your business. Some communities already have thousands of members talking about topics they care about. Join communities that impact your business and listen. What are members saying about the topic? What questions are asked? What ideas are discussed? All of this can help you understand your target market. For example, the Running community has people sharing challenges and questions about running. Members ask for recommendations on shoes, gear and other advice. If your business helps athletes, this could be a great place to engage and learn more about your target market. 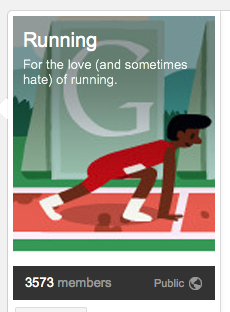 The Google+ Running community already has over 3,500 members and a lot of great engagement. 3. Gain insights for blog posts and product ideas. As you discover communities where your target market is located, join them and listen in on what they are saying. Discover ideas for blog articles and even get ideas for products or services you can provide them. 4. Become a thought leader for your industry. Communities allow you to start your own discussions and share content you care about. This means you can post articles that might interest your target audience. This is a perfect opportunity to become a thought leader by answering questions and being helpful. And if you’re really enjoying the community, ask the moderator if you could help moderate, too. This would help you stand out as a leader. 5. Drive relevant traffic to your website. As you engage with others in the community, you’ll find opportunities to share a blog post or article from your website. However, don’t spam. Be helpful and thoughtful with the links you share. Bills joined a Financial Literacy community that I’m building and posted info about how their site can help others save money (as that is a category in our community). Companies need to be careful how they do this (so they don’t spam), but Bills posted this after a discussion on how to save 10% of a paycheck. They didn’t link to their site, just talked about their product and shared an image. This could help them drive relevant traffic to their site. 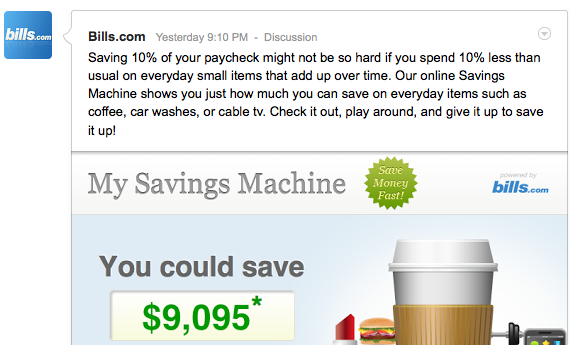 Bills responds to a post on how to save 10% of a paycheck and recommends their product without a link. Unfortunately, there isn’t a global directory of Google+ Communities at this time. To find public communities, you need to first log into Google+ and click on the Communities icon on the Google+ ribbon on the left. Communities link on left-hand navigation ribbon in Google+. When you first view your Communities section, you’ll find recommended communities on the left (based on communities people in your circles have joined). You’ll see any community invites on the right-hand side. Each community graphic shows a profile picture of a member or page you circled at the bottom. The Discover Communities section is your first peek at what people in your circles are doing in communities. And as you become active, you might start receiving other community invitations, so keep an eye on this page. You can also search for communities by topic using the Community Search bar. 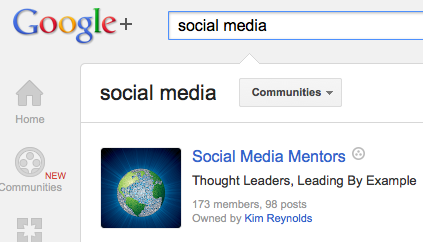 Simply do a Google+ search for the topic you’re interested in and select Communities in the drop-down menu. Ranking by which communities appear for each query is not known. Number of members, number of posts, keywords in title and connection to members might all play a factor. Once you find a community that you want to join, simply go to that community page and click the Join Community button. The Join Community button is located in the top right of the page. Once you join a community, you’re able to start participating by commenting, writing posts and sharing links. When you join a community, the notification settings should be off by default. This means you won’t get any notifications when updates occur. If you prefer to see all notifications, then simply click the bell icon (under the community graphic) to turn notifications on. Notifications can easily be toggled on and off by clicking the bell. Most of the time, you’ll want to leave notifications off to avoid getting inundated with notifications and/or emails from busy communities. But for small communities that are important to you, you might want to turn the alerts on so that you see every update. 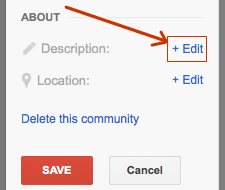 Tip: Set up a filter in Gmail to route community notifications into specific folders to free up your inbox. Some communities are closed due to spam and will require a moderator to accept you into the community. The benefits of private communities are that spam will happen a lot less (or none at all if you have diligent moderators). Communities that are private don't show anything to anyone unless they are accepted in. As you join communities, your Communities page layout will change by showing all of the communities you’ve joined at the top. There’s a red box notification that indicates the number of new posts of all new activities in communities. This appears over the community graphic. The Community page makes it easy to see where discussions are happening at the moment simply by watching the discussion count in red boxes. Search for topics your target market is interested in. Search using keywords important to your business. Creating a community is easy and you can easily create a Community page in less than 5 minutes. However, it always takes time to seed it with useful content and get the community going. What is the purpose of your community? You’ll need to write a few sentences in the About section. Should you or your company’s Google+ page own the community? Whoever starts the group will be the official owner and moderator who can assign or remove other moderators. You can assign different owners and moderators at any time in Settings. What kind of topics/categories do you want to feature in the sidebar? It’s a good idea to seed your community with content for each category. So have some blog posts or engaging content to feature in each category before promoting it. Do you have an approved image that you can use for your community? Make sure you have an eye-catching photo or logo (250 x 250 pixels) ready to go. Who will moderate your community? If you’re planning on having a public community, you should be aware of spammers and the importance of removing that content quickly. It helps to have more than one moderator watching the page and reviewing notifications. What will be the rules of the community? Write some rules about what you expect and what type of content is not allowed. Will this be a public or private community? If you want a private community, do you want it visible in search so that people can apply for membership or do you want the private community hidden? Or if you want a public community, do you want anyone to join and start contributing right away or does a moderator need to accept each member? Once you know the answers to these questions, it’s time to create your first community. After you log into Google+, click on the Communities icon in the left-hand ribbon. Then click on the red Create a Community button on the top right-hand side (right below your name). 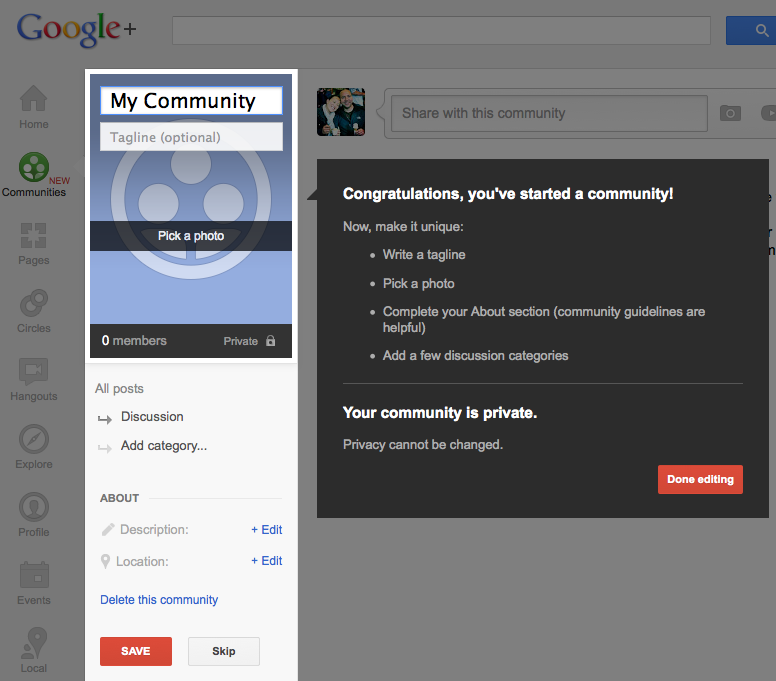 Screenshot of the Google+ Communities page. When starting your first community, be aware that the owner and official moderator of the community will be tied to your personal Google+ account. If you’re starting this community for a business, make sure to switch the Google+ account to the company page; that way, the company is the owner of the group. 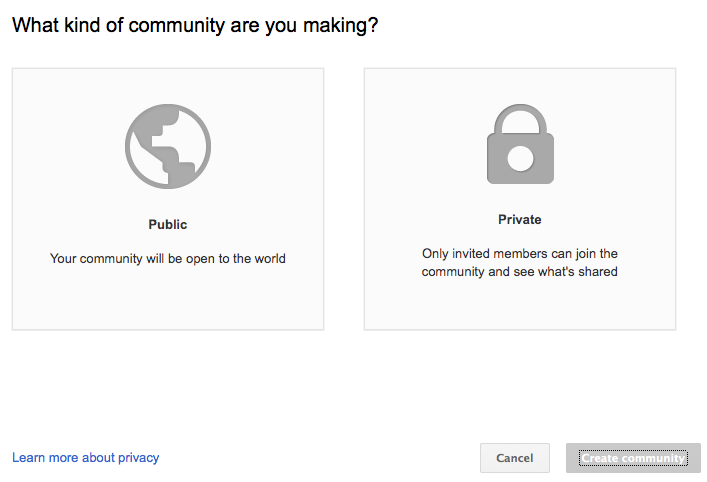 Once you click the Create a Community button, you’ll be asked whether you want to start a public or private community. Public groups are visible to everyone. Public groups can be locked so that people need permission from the moderator to join. Private groups can be listed in search, but nobody can see the content unless approved to join. 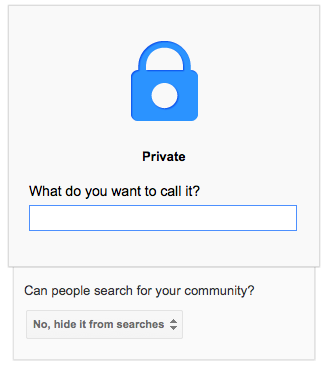 Private groups can be hidden from search so that nobody would know it exists unless invited in. You can choose public or private group. If you choose to start a private group, you can’t change it later to a public group. Private groups stay private. This has frustrated some community managers who weren’t aware that this setting can’t be changed. But now you know. If you select a private group, Google gives you the option to make it hidden from all search—or make it listed in search, but people need to apply for membership from you to see or join discussions. After selecting the type of group, you need to add a group name. After selecting the type of community you want, you need to name your community. Don’t worry if you’re unsure of a good name, you can always change it later in Settings. Similar to Google+ pages, you have the option to add a tagline and unique photo for your community. The photo needs to be at least 250 x 250 pixels. When choosing a picture, try to pick an eye-catching image. And your tagline can be up to 140 characters. While in this setting mode, the community name can be edited and changed as often as you like. Community names can be no longer than 50 characters. This is how your new Community page will look while editing when you first arrive. As you choose your tagline and community name, think about the keywords your target audience might use when looking for your group. There is no guarantee where your community will rank within Google+ Community Search, but when you put important keywords in your tagline and/or community name it will help you get a bit more visibility in the beginning. Once you click Save or Done Editing during this stage, you can easily get back into editing mode by simply clicking on the Actions drop-down menu (under the photo) and selecting Edit Community. Click on the Actions button to see the drop-down menu. This is how you can edit your Community page at any time when you are the owner/moderator. While in editing mode, click on +Edit link. While in editing mode, you can click on +Edit to update the Description field. This opens up an expandable box that you can paste in your community’s About content. This text appears on the sidebar, so this could be a good spot to also list some simple rules for the community or even a business phone number or email address. The About section is an expandable box in which you can paste content. Keep content brief. The content in this About section can be very lengthy, but only 641 characters will be visible on the sidebar (and then a View More link will appear). List the organization behind your community (if applicable). Share the mission of the community. Add contact information like phone numbers or email addresses. Hyperlinks don’t work, but you can still list your URL. Right below the About section is the Location link. If your community group is affiliated with a business, you can list the company address here. If you have a local community group, you could just list the city name. 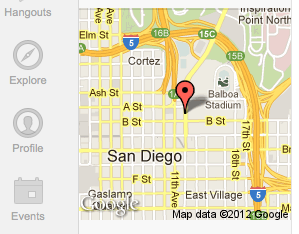 Maps appear in the sidebar at the bottom if you choose to add a city or address on your Community page. The benefit of adding a full address to a business is that a map appears that links to the Google Maps listing for the business. Now it’s time to start writing some categories. This will evolve over time, but you want to start some potential topics for your community to put posts under. Obviously, you’ll want to include categories specific to your topic/industry. Think about the types of categories for blogs in your industry. 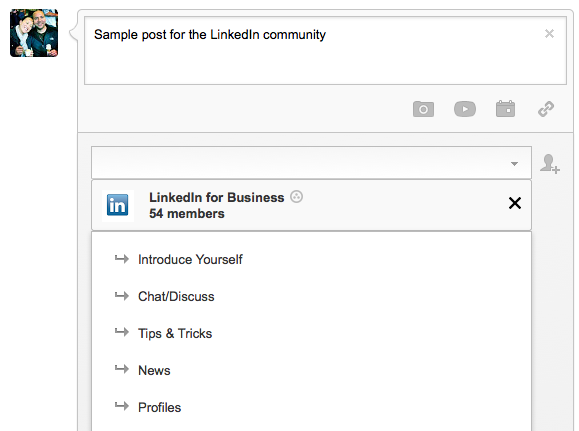 Or check out similar communities on Google+ to see what types of post categories they are using. After you create your list of categories, you can move them around by clicking on a category (while in edit mode) and dragging into the new position. Once you’ve added categories, it’s time to start posting content in each category you’ve created. This way if someone clicks through categories, they’ll see some posts there. If you’re going to start and moderate a group, you’re going to want to have notifications turned on (to help you moderate discussion and spam). Google will flag some of the content as potential spam, but you need to also keep an eye on it. When I first started my group, I was getting inundated with dozens of notifications in my Gmail box. To clean up my email, I created a rule to categorize Google+ notifications into a specific folder. This is highly recommended if you create communities or join lots of communities (and want to get notified with updates). Once you’ve added content, you should begin inviting friends and colleagues whom you think might be interested in your new community. Don’t spam your circles if it’s not relevant to them. Just invite people you think would be interested. And then share your community by pasting your URL. Share your community with your Google+ followers. Invite followers on other social networks to join you there. Invite thought leaders to become moderators of your group. As with any community, it’s good to set up some rules on what you will (and will not) allow. Expect self-promotion (or even spam), so make sure you have rules in place on how you will moderate discussions. Create some fun categories like “Introduce Yourself” to encourage anyone who joins the group to quickly get engaged. As your community grows, you may need some help to moderate discussions and flag spam. 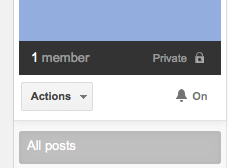 To assign a moderator, first click on the member count below your community photo. Click on your member count to see the full list of members first. Once on that page, find the person you want to make moderator and click on the little arrow next to the Add to Circles button. The arrow will reveal a drop-down menu allowing you to make that person a moderator of the group. Nobody wants to see spam in their group, so watch your notifications and delete any spam quickly. Set up rules in your Gmail account to help you manage the updates in your community. The more active people, the more moderators you might need to help you keep up. You’ll want to start your community by creating some default categories for discussion, but as the community grows and discussions evolve, you might want to create new categories to fit new topics that arise. Sharing content with your communities is just like sharing content with your public stream and circles. You can post to your community anywhere on Google+ by simply selecting your community in the drop-down menu (as you would a circle). You then get options to post to the community categories. After typing your post, simply select your community by typing "@" or "+" and then your community name. It’s never easy starting a new community, so make sure you show your appreciation to anyone who joins by +1ing content they submit, commenting on their posts and even circling them to +1 and comment on general content they post on Google+. Take the pressure off of yourself and allow others to help you moderate the community. Remember, this is not about you—it’s about the community. If for some reason you don’t want a certain post shared outside the group, simply lock the post. This will prevent your content from getting shared to people you don’t want in the group. This doesn’t mean people can’t grab a screenshot and share it—so it’s best to assume that anything you write can be shared outside of a community. But locking a post is one way to keep things a bit more private. At this point, if you add a post into a category, it can’t be moved into another category so be careful where you add it. This covers everything you need to know about Google+ Communities and how to leverage them for your business. So what do you think about Google+ Communities? Will you be joining? Or have you already found a few communities that you like? Let me know what communities you’ve joined or find interesting. Leave your comments in the box below.